Hotel Life Deluxe 100% Cotton Sateen Sheet Set In Queen Just $16.99! Ships FREE! You are here: Home / Great Deals / Hotel Life Deluxe 100% Cotton Sateen Sheet Set In Queen Just $16.99! Ships FREE! Live in luxury with these elegant sheet sets from Fine Deluxe Hotel. Wrap yourself in these silky smooth, 100% cotton sateen bed sheets and sleep comfortably tonight. 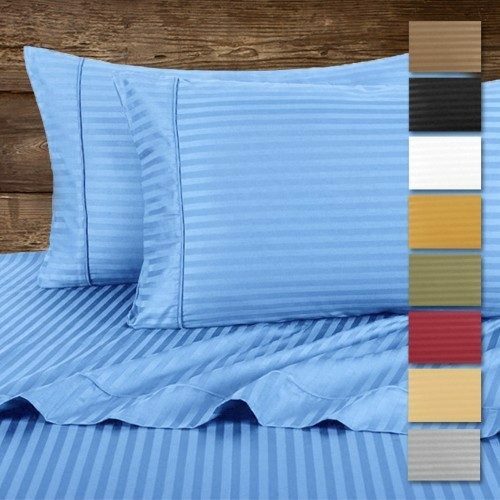 These sheets are made with the finest quality fabric and will have you sleeping like a baby. The Fine Deluxe Hotel sheets feature deep pockets for up to 15″ extra large mattresses! Get the 4 Piece Set of 100% Cotton Sateen Sheet Set in Queen for Just $16.99! Twin is only $8.99! King is $18.99! Plus FREE Shipping! These Prices expire on 12/1!